The only thing that Mr Pepperpot wants is a pot of blueberry jam to go on his pancakes, so Mrs Pepperpot storms out to pick the blueberries to make it. But when she is out in the woods she shrinks! There are lots of scary animals: a fox, a wolf and a bear. Will her cunning be enough to get her back home in time to make the jam? 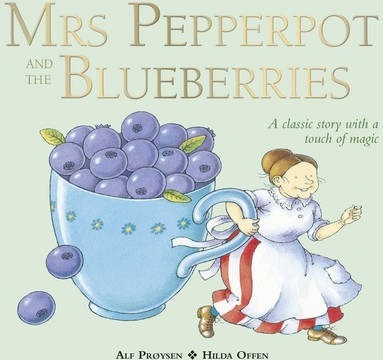 A new classic Mrs Pepperpot story beautifully illustrated by Hilda Offen. Alf Proysen (Author) Alf Proysen was born in Norway in 1914. The Mrs Pepperpot books first appeared in the 1950s and were an immediate success. They have been loved by children ever since and have been translated into many different languages.Hilda Offen (Illustrator) Hilda Offen is a well-known picture book illustrator, who won the Smarties Prize in 1992 for Nice Work, Little Wolf. Since then she has illustrated many picture books, including Fred and Ted's Treasure Hunt. She lives in Brighton.